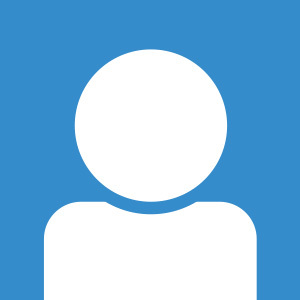 There are many different routes through which drugs and other medications can be delivered into a patient’s body during treatment. These include topographical ointments, pills, vaporizers, and injection systems, among others. Many of these drug delivery systems require an enormous amount of precision when it comes to the location, timing, concentration, and amount of the drug to be administered. This is where simulation can be a big help, as it can allow for the modeling of each of these aspects of the drug delivery system. When it comes to drug delivery, ensuring that the proper dosage of the drug is administered is key. Diagram detailing the operating principle of the drug delivery device. The droplet’s color represents the concentration of the drug. As the droplet passes through the section of the capillary surrounded by a permeable membrane, the drug concentration increases (from blue to red). Because the capillary tube is a cylindrical shape, an axisymmetric geometry can be used to represent the system. A certain section of the capillary tube has its surface coated in a permeable membrane containing a concentrated solution of the drug. 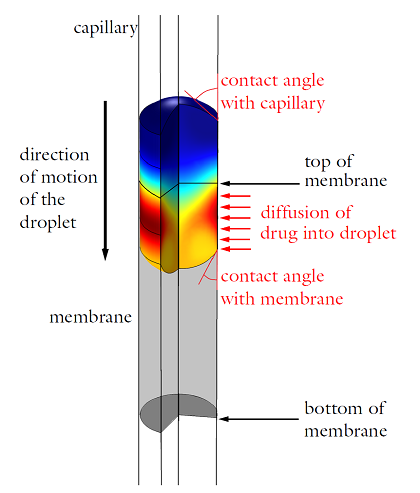 When the surface of the droplet comes into contact with the membrane, the drug will diffuse inwards, dispensing the desired dose into the water. The final concentration of the drug within the system will depend on the velocity at which the water droplet is traveling as it passes through the membrane — when the droplet is only in contact with the membrane for a brief period of time, less of the drug will dissolve than if the droplet was touching the membrane for an extended period of time. By varying the velocity of the water droplet, the final concentration of the drug in the droplet can be regulated. 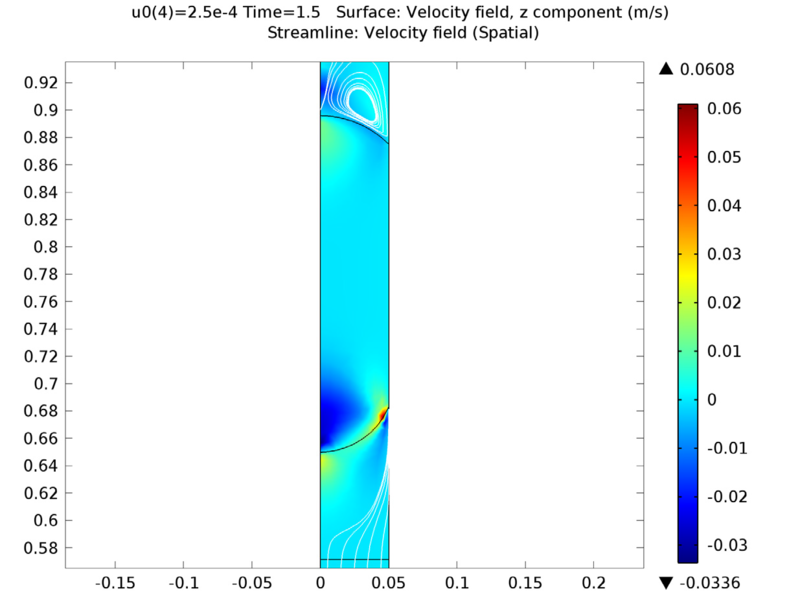 Velocity of the flow field surrounding the water droplet as it passes into the permeable membrane. Click image to enlarge. 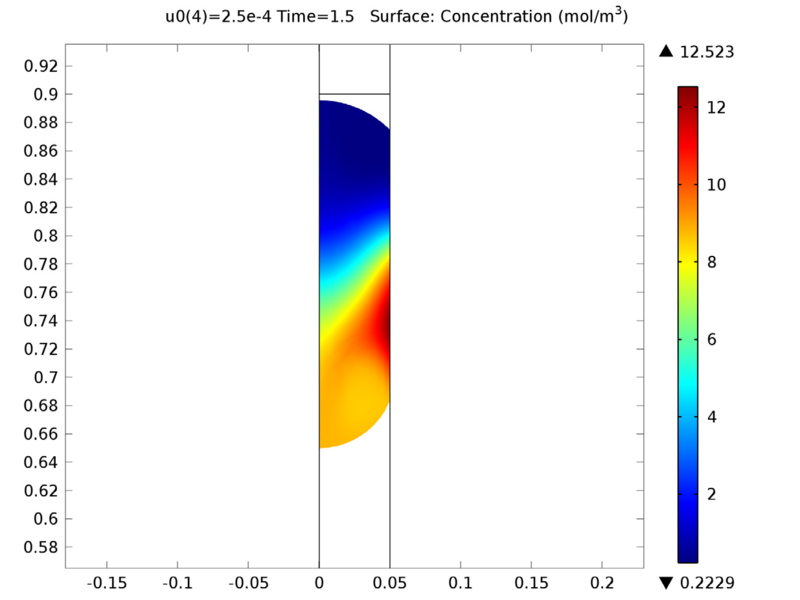 The drug concentration in the droplet as it travels past the edge of the permeable membrane. Click image to enlarge. We can examine the total amount of the drug that has diffused into the droplet as a function of time. In the graph below, we analyze the quantity of the drug in the droplet when the drop is traveling at a speed of 0.1 mm/s. As can be seen in the graph, the drug concentration increases with an s-shaped profile. The steady increase between 3 and 6 seconds corresponds to the time where the droplet’s surface is in contact with the membrane. 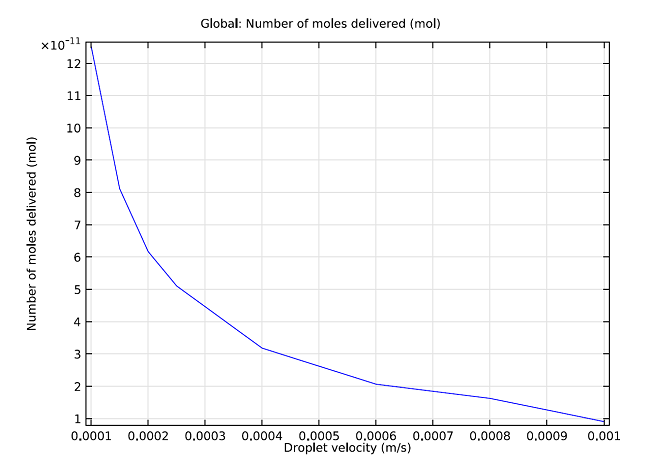 Additionally, we can measure the total number of moles delivered into the droplet against the droplet’s velocity. 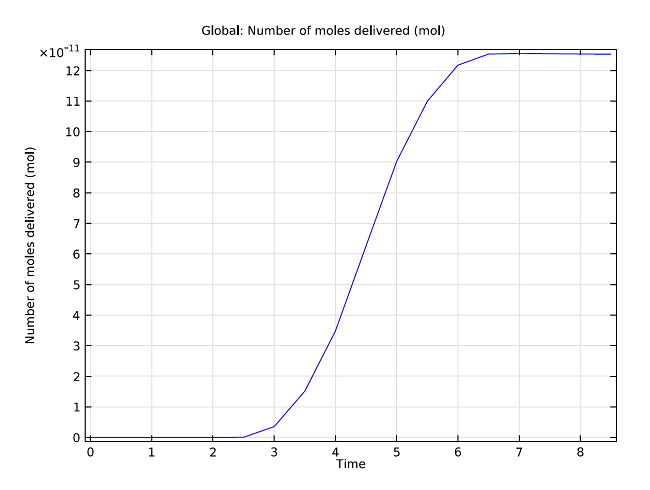 As can been seen in the graph below, the number of moles delivered into the droplet is approximately inversely proportional to the velocity of the droplet. Therefore, we can vary the amount of drug that is allowed to diffuse into the droplet by altering the time it takes for the drug to pass entirely through the membrane. With simulation, we are able to precisely and accurately anticipate the exact velocity needed in order to achieve a certain drug dosage. 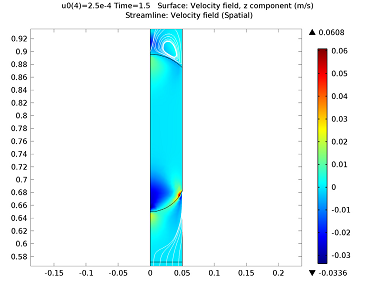 This system is accurate down to the picomole, and using simulation we can find the optimal velocity and time in order to administer a desired drug concentration.